Today, I experienced something totally awesome that only the convenience of technology and a creative mind can bring. With the launch of the Postmates app in PDX, a convenient delivery service that brings you virtually anything you please from your immediate neighborhood businesses, I took advantage of a sweet deal they offered for their big launch. 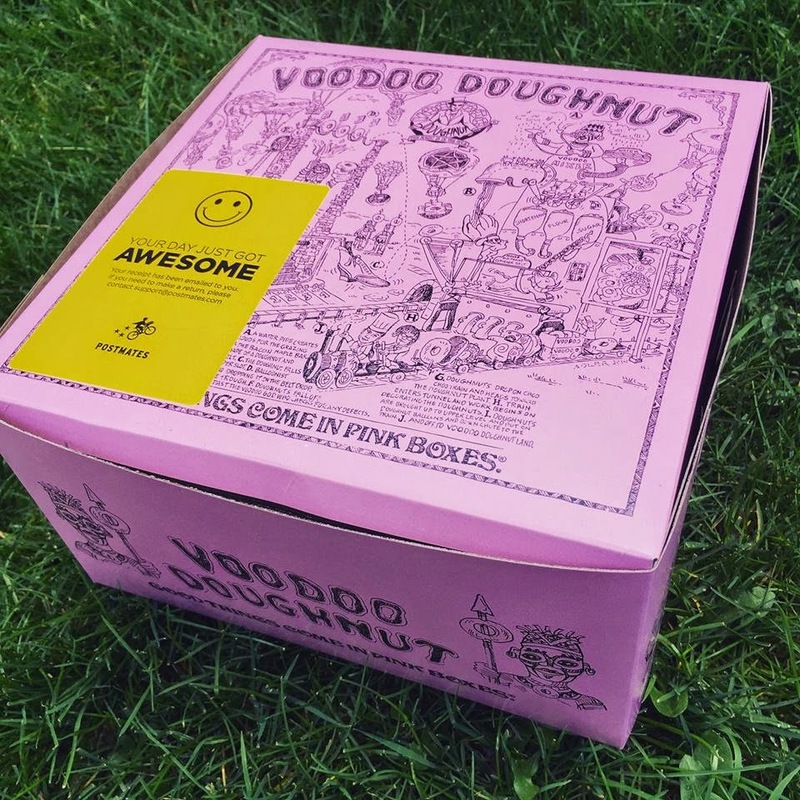 That sweet deal came in the form of that infamous pink box with those irresistible doughnuts that Portlandians have come to know as Voodoo. A little bit of background about the app, which I learned about from Eater last week - it functions on an Uber-like model where messengers who happen to be in your community get your request and deliver the goods upon demand. You can order virtually anything from a 5 or so mile radius, which works out perfectly in Portland. 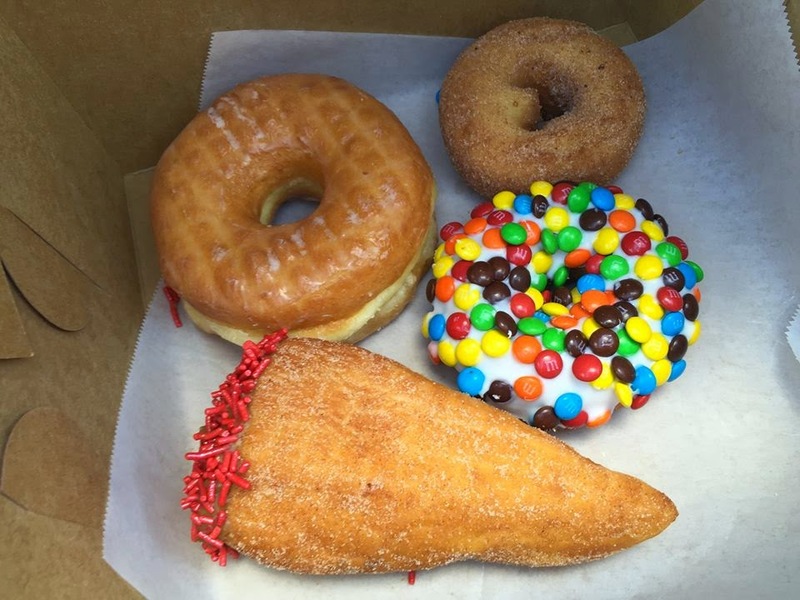 From doughnuts to ice cream, pizza, sandwiches or even non-food items, your certain something can be in your hands in under an hour. What I liked about my experience from the get-go is the effective communication I got both from my messenger as well as the Postmates staff. It's so easy to text back and forth to clearly understand the status of your order. It goes without saying that I was completely hooked on getting Voodoo Doughnuts - a free four pack as it happens in honor of Postmates' launch in PDX. Making sure to order them right around 1 p.m. when delivery opened up, I got instant notification that a randomly selected box of four treats was on its way. Good thing too that I ordered them quickly, as I saw this offer was completely sold out in just a few minutes. While it took over an hour to get my order, the communication and progress was so thorough that I didn't even mind. And when my doorbell rang and a friendly messenger appeared with that box, I couldn't be happier. I signed for my free goodies and proceeded to have my doughnut party in the comfort of my backyard. Opening the box, I noticed four different varieties including a cinnamon cake doughnut, an M&M frosted cake doughnut and two glazed doughnuts as well. One of them was in the shape of a horn and was further frosted with chocolate and red sprinkles. It was all very sugary, fluffy and oh so delicious. I broke into the M&M and the horn taking a few small pieces and devouring each bite. Not only were they fresh, some were even slightly warm which was a great sign and totally sealed the deal with Postmates. So much so that I decided to order a free pint of a Ben & Jerry's Chocolate Fudge Brownie ice cream to boot. This one came in just 40 minutes, and further surpassed expectations. Because Postmates is so new in PDX, they're offering free delivery til the end of the month, after which you'll have to pay a delivery fee depending on your distance to the place you're ordering from. So far so good though, I'd say, as I'll certainly be using the service a lot more in the future. 3 Mmmms and yays all the way!